High quality choral and orchestral performances can be heard and appreciated by all; however, many BAFCO activities, essential to the smooth running of the organisation go unnoticed. Thank you to orchestral members who fold music stands and put them into boxes after a performance, and to Barry, Bill and Ian for packing away these boxes and other artefacts, supported by Fred, Roddy, Ben and Adrian. Thanks to Ali for choir administration, for getting the concert wine, setting it out and, with her choral team, serving it (and even getting the choir and orchestra to pay for it), and, of course, clearing up afterwards. Thanks to Eileen, Margaret and Shenagh for library work at home or abroad, and to Linda and Ann for programmes and publicity. A choral thank you to Molly and George for their parties, and to Sally for keeping the choir regimented and documented, ensuring not too many get away. Particular thanks to Celia Burrage who, for so many years, kept JSPL on the straight and narrow, and who developed a formula for our overseas tours. Personal thanks from JSPL to all members of the group who, particularly on tour, have taken on a corporate responsibility for its activities; to Nigel Springthorpe for joining him to produce the book ‘The Art of Conducting’; to Cuckoo, the village church choirmaster, who sparked his choral interests at the age of six; and Miss Ebbet, the village organist who, in the last year of her life, commenced his keyboard training. 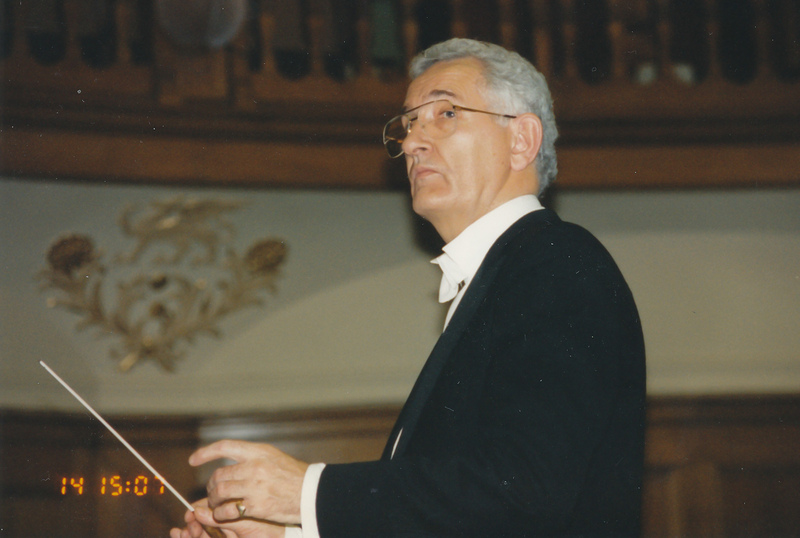 BAFCO has undertaken approximately three hundred concerts. Fifty of these were choral – on View Days, Luketide services, carol concerts, memorial and celebratory occasions. The G&S Society undertook twelve staged productions and four performances of Trial by Jury at various venues, together with five concert performances of light operas. The orchestra was involved in five marathons, twenty four concerto days, twenty four instant operas and five workshops. The group has undertaken fifteen DIY events, twenty two instant oratorios, eleven overseas tours, and has performed in thirty-seven churches, twenty-six concert hall, five universities, four outdoor concerts and some caves. Whereas the Pope brought along at least a hundred cardinals and two audiences of around thirty thousand, back home we were delighted to sing for one cardinal and three archbishops. So, what were the highlights? We have been privileged to play not only in Barts Great Hall in London but also the Albert, Royal Festival, Barbican and Guildhalls. Other memorable venues have been the Jerusalem Symphony Hall, the Swiss Romande Hall in Geneva, the Menuhin School in Gstaad, and the great cathedrals of London and Rome. I hope each member has wonderful personal memories and experiences. Mine are the memories of visiting the Uffizi and Palatine Galleries, seeing Michelangelo’s David in the Academy of Fine Arts, and the tombs of that great master and Rossini in Santa Croce, together with conducting a concert, all within one Florentine day. Also our visit to Val de Gras, the home of Larrey, the greatest of all military surgeons. Our concerts at the Royal Festival Hall and the Bicentenary of the Royal College of Surgeons were unique events, but for inspired performances, I think of The Creation in Zion Abbey, just after we arrived in Israel, many of the choir taking a nap during the arias; and the Mozart Requiem performed under the rose window of Chartres.